I will be taking on some workload from Nova with bugs related to Quests / Drops / Portals so more time can be allocated to focusing on other bug fixes / implementation of other content. You may report any bugs related to quests / missing drops (both quest and regular monster drops) / portals. Kindly follow the following format when making a report. Be sure to read through the following FYI spoiler to help me speed things up. It'll be helpful to not spend 5 minutes trying to figure out what is being reported if I have sufficient information in the report itself. That time can then be used to work on other things, like implementing missing quests. On that note, you can make a suggestion for missing questlines here. Use the forum search function to avoid making duplicate bug reports / to look for a solution if you are unable to progress through crucial content. You are likely to just be missing out on something. Do not report quests you cannot start / complete - They are not bugged, they are just not coded (or you are stuck, use @ea). Quests that you need to progress through pivotal content on the server should already be working. Unless you are absolutely sure they are bugged and should be working, please don't submit reports of such nature. How do I know if a portal is bugged ? - You should either receive a message in the chat window stating that "This portal leads to nowhere" or if a portal does not work like its supposed to on the official server. Kindly include sufficient information if you're making a bug report of this nature (Ex. Map it happens on, which portals (left, right up, down, you get the point). What are Reactor drops? - Entities that players can interact with, are known as reactors. Such as boxes, plants, zakum's altar when an Eye of Fire is dropped etc. Some of these drop items. If a reactor has missing item drops, do make a bug report in this thread. Make a separate thread for bugs of other nature (unrelated to missing / wrong item drops). If the bug you are about to report is not related to Quests / Portals / Missing item drops, do not report them on this thread. Make a separate thread and Nova will get to them when he can. Description of the bug : Deimos Sage Shield Recipe not dropping from mobs nor can be found via @drops, when Deimos Warrior and Darkness shows up and does drop from one of the mobs that I've tested which is Advanced Knight D.
Description of the bug (Please try to be specific, which map does it happen on, which quest etc.) :For the Angelic Buster Quest "Meet the Mastermind", the portal leading towards the quest location doesn't work and instead sends the message, " This Portal does not lead anywhere". Description of the bug : no lightbulb on Rona(daily quests) on my zero, i tried @ea and relog, doesnt work. i went on my other character(hero) he has daily quests available. Description : For the quest "Dark Swamp Region", the Witchgrass Leaves are not registered for the quest. Description of the bug : Animal Fat does not drop. The map is Esfera, Living Spring 7. Fix will be pushed next server restart. Description of the bug: The portals in the map <Year 2215> Bombed City Center Retail District doesn't seem so be working (on both left and right side). I've tried @ea and changing channels but I cannot seem to access the portals. No message appears in chat. I've also tried the portal to Tera Forest in the map Minar Forest : East Border but it doesn't seem to be working either. I got into the Bombed City Center map using Quick Move, through the Intercontinental Station teleport. Tera Forest was removed from GMS a while ago. Description of the bug: The quest The Story Thus Far's rewards didn't given to both Demon Slayer or Demon Avenger upon finished regarding player still have space in their inventory. Thank you for reading Mr. X, you are the only hope right now. Bug type: Quest (Drops) [Morass] In Search of the Diary. Did you use the Kritias Research Journal use item that drop from the mobs? Description of the bug (Please try to be specific, which map does it happen on, which quest etc.) : The Luminous Emblem quest (Luminous's Token for a Epic Hero) is bugged is unable to claim. All characters receive a Gold Maple Emblem at level 200 at the current time as extremely few of the emblem quests are coded. 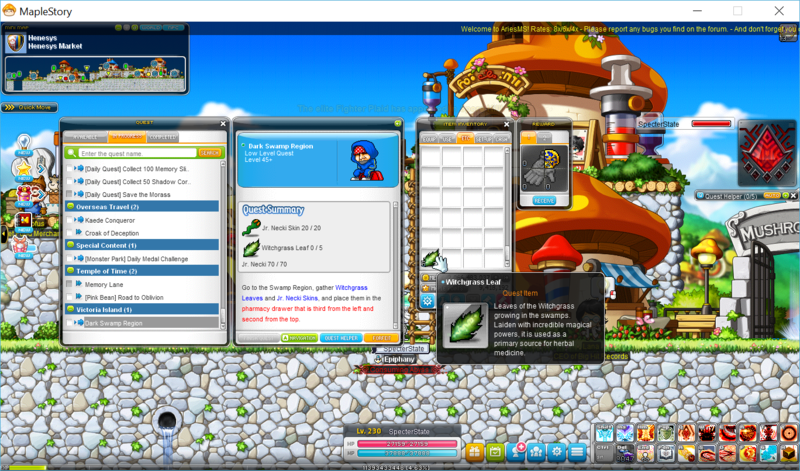 The quest bubble for Pioneer of Destiny appears after reaching lv 200 and cannot be completed, leaving a completed quest book bubble above the character's head. When attempting to finish the quest an error message pops up: "You have this item already: Pioneer of Destiny". This is not a quest bug. The medal is a one of a kind item, so simply toss the one you currently own in order to complete the quest.